Black men are no different from any other man of any race and can become distant in an interracial relationship. This can be brought up by the way the woman he is with is communicating her emotions to him. If you are a white woman in an interracial relationship and your partner is withdrawing, this article will highlight three wonderful ways to bridge the gap and bring him closer to you. Men of all races not just black men are known to sometimes be in their own world but this does not mean they love you any less. Love is a beautiful thing and can leave a black man feeling vulnerable. Withdrawing is just a way of him not wanting to lose himself. He will come in and out of this phrase but one of the things you can do as his woman when this happens is to simply remind yourself that this is completely natural. If he loves you and sees you in his future, these phases will happen less often the longer you stay together. 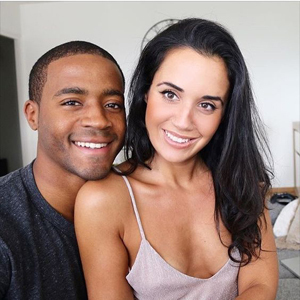 As his woman, when your interracial partner or man withdraws, it is natural to want to lean in and close the gap, however, this requires plenty of effort. When you are putting in plenty of effort to close the gap, it can cause your man to resist any attempts to make things better. Why is that the case? It is because you are making him feel forced to get out of that mind set. The best way to create tension is to give him some space. Do not message or call him at all, let him be the one to make the decision to come to you. As soon as he does it will make you feel a whole lot better and desired by him. When a man is pulling back, it is normal to feel some type of way inside because you might feel uncertain, upset or ignored. When he eventually snaps out of it and comes back to reality, it is hard to pretend like everything is okay because you will want him to know that you were hurt by his actions. Words carry a lot of meaning and need to be picked wisely because they can make the connection you have deeper and he will become more respectful of your feelings next time he wants a moment to himself. The best way to go about things is to communicate with him in a way which conveys how you truly feel without putting the blame on him. Using words like “I am so thrilled you called me” is a lot better than “why did you not bother to call me”. Showing your man that having an interracial relationship with you is a great and fun experience will make him feel happier. If he notices that you didn’t let you emotions get out of hand, it will make him become connected and closer to you. © 2019 BlackWhite.singles. All Rights Reserved.